I know my bridesmaids are going to love these! I can't wait to give them to them!! 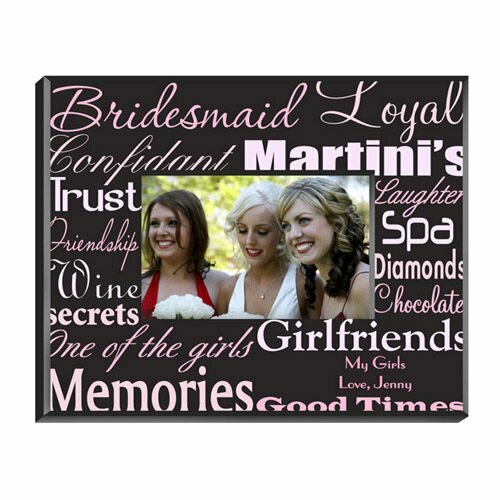 This will be a nice gift for one of my bridesmaid but I wish there were a larger selection of colors to choose from. My wedding colors ar blush and chocolate. I'm constantly on the lookout for items of those colors that I can incorporate into my wedding without it looking juvinile of too matchy-matchy. 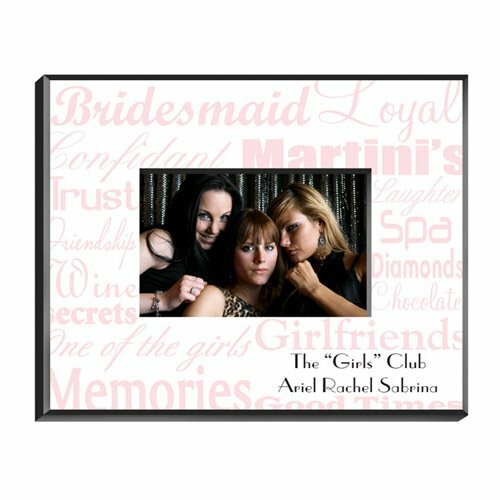 These frames are a perfect keepsake for my girls. The personalization looks like it's part of the design. I couldn't be happier with the way they turned out. This is a great present. I would order again from this company. It was very pretty. And was shipped so fast. I love them as soon as I saw them! No question that I should buy these! My bridemaids are going to love them! I loved them!!!. They were perfect. I am jealous that I don't have one. 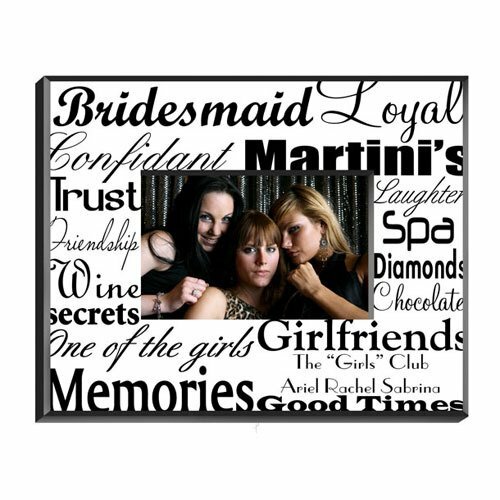 She's shared in your secret adventures and giggled at your inside jokes—continue to give the gift of gab with this custom-printed picture frame. Each personalized bridesmaid picture frame captures those special just-between-us-girls moments with pre-printed words such as, "Laughter," "Memories," and "Girlfriends." 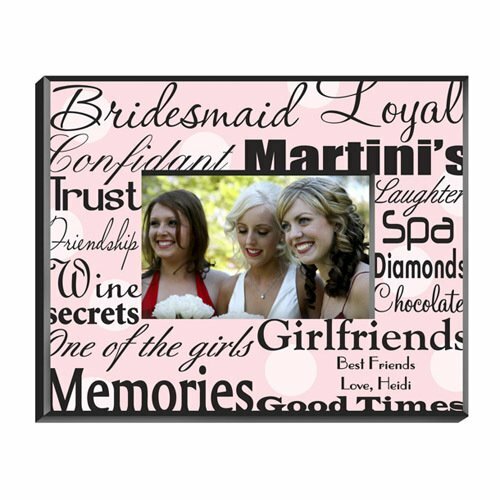 The bridesmaid picture frame can be personalized with up to two lines of text (20 characters per line) in the lower right corner. 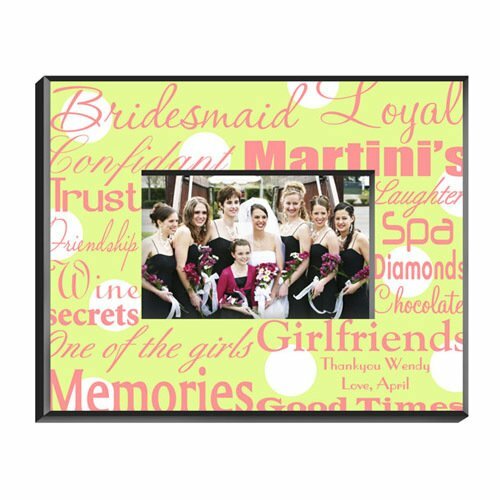 Each frame is made of durable wood composite and is printed using a heat transfer technology that ensures a scratch and fade proof product. Measures 10"L x 8"W and holds a 6"L x 4"W picture. 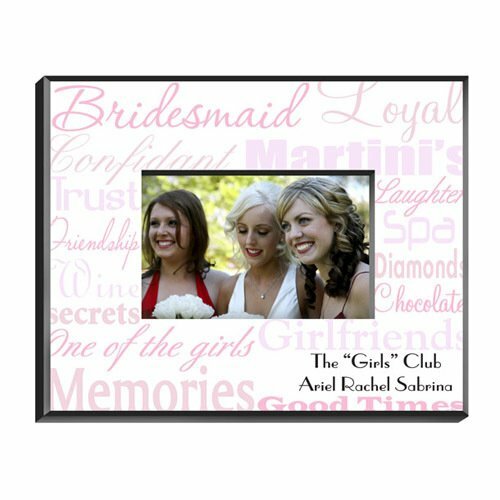 Insert a favorite photograph and give as picture-perfect maid-of-honor gift, bridesmaid gift or bachelorette party favor. Perfect when paired with any of our gorgeous bridesmaids gifts.